(a) & (b): Central Government civil servants appointed before 1.1.2004 are governed by the Central Civil Services (Pension) Rules, 1972. In accordance with Rule 49 of these rules, on retirement after completing a qualifying service of not less than 10 years, a Government servant is entitled to a pension calculated @ 50% per cent of his last drawn pay or 50% of the average of last 10 months’ pay, whichever is more beneficial to him, subject to a minimum of Rs.9,000/- per month and a maximum of Rs.1,25,000/- per month. 2. A Government servant appointed on or after 1.1.2004 is governed by the National Pension System. 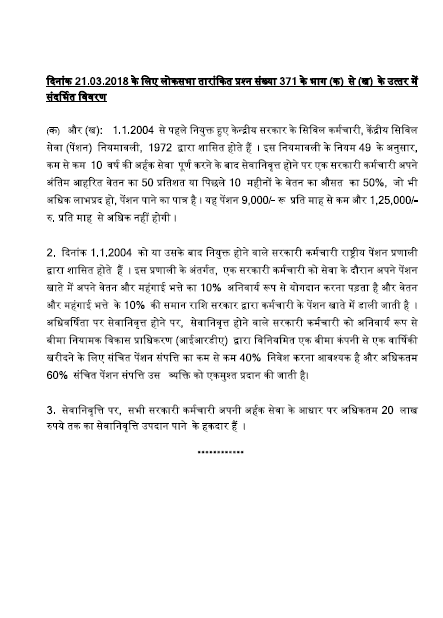 Under this system, a Government servant is required to mandatorily contribute during service 10% of his pay and dearness allowance to his pension account and an equal amount of 10/00 of pay and dearness allowance is contributed by the Government to the employee’s pension account. On retirement on superannuation, the retiring Government employee is mandatorily required to invest at least 40% of the accumulated pension wealth to purchase an annuity from an insurance company regulated by the Insurance Regulatory Development Authority (IRDA) and a maximum of 60/00 of the accumulated pension wealth is given to the individual in lump sum.